From the beginner to the advanced rider, you will learn polo style riding which is unlike any other discipline. This means using your legs most of the time with one handed neck reining. The polo horses are extremely sensitive and respond off your leg ques immediately which gives the rider the freedom to enjoy the ride at a more relaxed stance. Neck reining with the left hand allows your right hand the freedom to hold the mallet. One of the islands best kept secrets, Dillingham Ranch with 2,700 acres has a rich history and strong foundation of the paniolo culture dating back to the 1800s. Located on the quiet side of the North Shore of Oahu, Mokuleia is home to a number of other extreme sports besides polo, next door is a private airfield, home to skydiving and the glider port and of course numerous uncrowded spots for big wave surfing. Book a stay at the Lodge at Dillingham for large events or weddings. 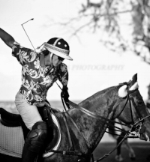 Supporting women polo tournaments have been a passion and fundamental avenue for students of Hawaii Polo Academy. This short clip shows what it takes behind the scenes for a successful polo match.